The bell-shaped European pear, Pyrus communis, and the round Asian pear, Pyrus pyrifolia, are both true pears in the same plant genus. This means that you can also enjoy them in similar ways: fresh, cooked or preserved. You have the option of eating the skin of an Asian pear, as it is a source of fiber, or you can peel it off. The Asian pear goes by several names. "Apple pear" describes what the fruit looks like more often. Most Asian pears are round with an indentation where the stem protrudes. The Chinese variety is the exception, as it resembles the traditional bell-shaped pear. The skin of an Asian pear ripens to a gold-to-brown color while the pear is still on the tree. That is in contrast to the European species that finishes maturing after harvest and usually becomes yellow, sometimes greenish. 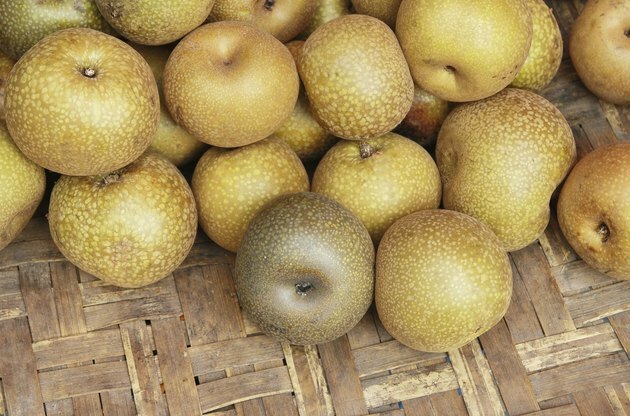 Although smooth to the touch and delicate, the Asian pear skin might feel thicker and rougher when you bite into it than the skin on a European pear. If you peel the skin off, you'll be missing out on some dietary fiber. The enzymes that break down food during digestion cannot metabolize fiber. The material binds to waste and helps to push it out of your body at a moderate pace. Besides preventing constipation and diarrhea, dietary fiber may help lower cholesterol and stabilize blood sugar levels. Fiber may also help you to lose weight by creating bulk that helps makes you feel full with just a few bites. Keep in mind that you should wash all fruit before eating it to remove bacteria and dirt from its skin. Use cold tap water and your fingers and palms to rub it. Clean the indented area surrounding the stem, where debris can become lodged. Wait to wash the Asian pear until you are ready to eat the fruit to prevent bruising. When the skin is injured, the pear begins to lose its quality in storage. Wash the Asian pear even if you intend to peel the skin to keep bacteria from transferring to the flesh. Ripe Asian pears are firm like an apple, not soft like mature European pears, notes the Centers for Disease Control and Prevention website. Touch the whole fruit, especially any blemishes. If it feels squishy, put the pear back in the supermarket bin. In addition, hold Asian pears close to your nose to detect a sweet smell. This pear species keeps for three months in the refrigerator.